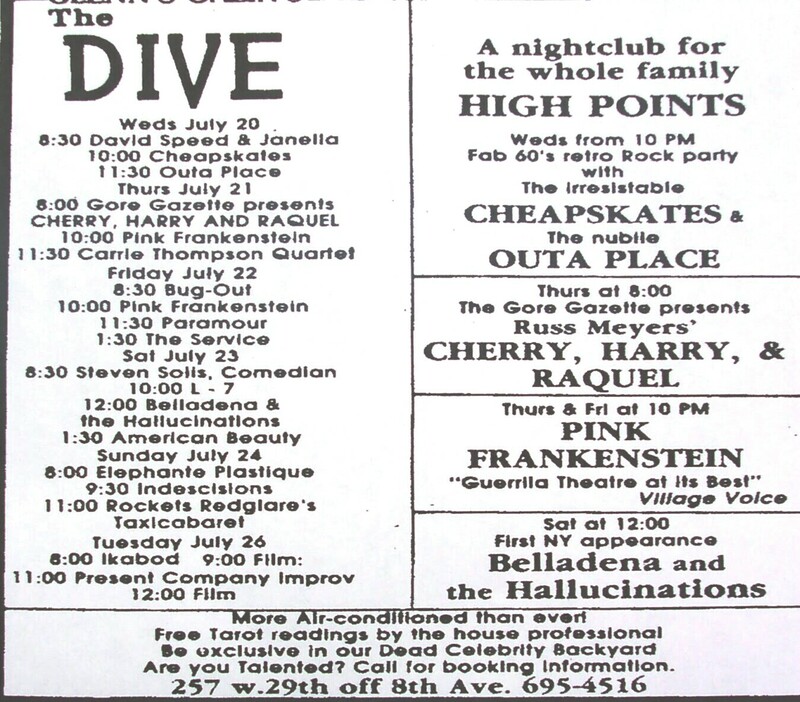 When it opened in 1982, The Dive was billed as a cabaret club and featured acting troupes, music, magic, and films. Before a change of ownership in 1985 all of these performing arts were still featured within the weekly fare. Formerly named Port Said (pronounced sah-eed) a Mediterranean belly dancing club in the heart of a dying (at the time) furrier district the stage was surrounded with mirrored tiles and had a large wooden floor with a small platform in the rear corner, just big enough for a drummer's kit. The carpeted room was filled with chairs and candle lit tables on the stage level with more tables on a step-up level that led back to the bar. The unique part of going there (much to the chagrin of some patrons) was that you never knew what to expect from one act to another. Glenn Gazin the owner was always performing a "mind reading" act that he had perfected. And aside from an occasional "theme" night a one act play could be followed by a techno pop performance, followed by a rock & roll band. In the 1983 Village Voice ad at the top of this page there is a Sunday night, 11:00 listing for "Rockets Redglare's Taxicabaret". This was a comedy troupe from New York's Lower East Side that performed on a series of Sunday evenings and featured then aspiring actor/comedian Steve Buscemi as well as a host of others. In the same ad above there is a Thursday, 8:00 listing for "The Gore Gazette Presents". 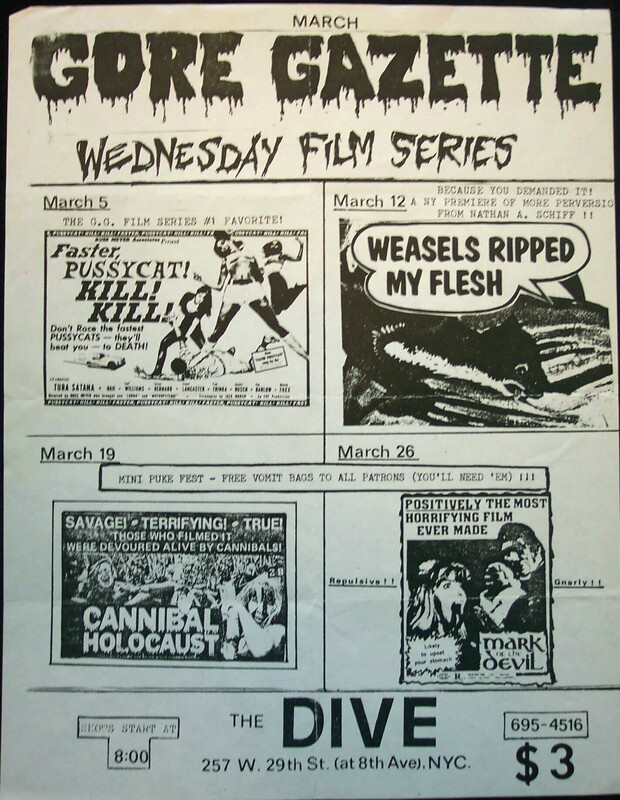 This was a weekly film series (which moved to Wednesday evenings in 1985) put on by a fellow named Rick Sullivan who also published a monthly horror fanzine named The Gore Gazette. While he was screening films at The Dive like "Flesh Feast" and "Last House on the Left" the audience would always have a great time, with some members loudly cracking jokes. Although at other times when the action on the screen would become too intense the bar would fill up with patrons who would rather not watch but didn't mind listening. On some nights he would bring in one of the cast members or even the director of a particlular movie to do a Q & A with the audience after it's screening. 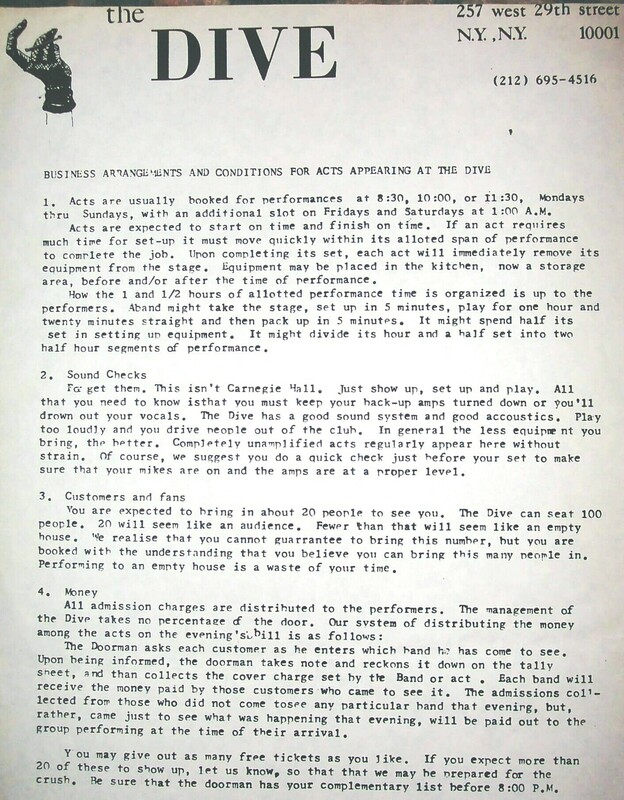 One of the unique regular policies was The Dive allowed each performer to charge and keep 100% of their own cover price for their act. Those who frequently attended would simply look at the list and say they were there to see the act that was charging the least. Why pay eight dollars for the band that you came to see when you could pay three dollars for another act on the same night? The doorman would try to circumvent this by first asking people who they had come to see. But when the person in front of you just paid much less than you were now being asked to pay it didn't make his job any easier. That coupled with the fact that the club had no "guest list policy". Performers were allowed as many guests as they wanted. Some didn't care about door money so they would hand the doorman pages of names which were rarely if ever alphabetized. Some lists (as a laugh) would include the names of such dignitaries as Mayor Koch, Ronald Reagan, and George Stienbrenner. On nights when there was no doorman, the performers had to station thier own person at the door. Because of "trust" issues you would sometimes have up to three people manning the entrance. And if some poor soul just wandered in he would be descended upon by all three of them. As stated before, the performer would get to keep 100% of the door money. The club had a capacity of one hundred or so people so (unlike other clubs) an act could make out pretty well on any given evening. The document below was recently submitted by Tony Matura of the band The Optic Nerve. It was given to him upon securing a booking in 1983 for a band that he was in at the time named The Longhorns. 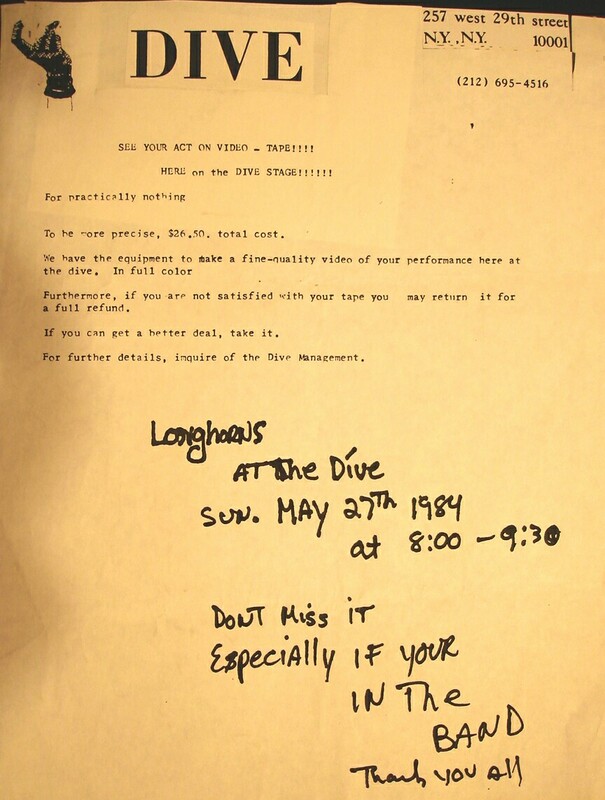 The letter below (again provided by Tony Matura) is an offer from the Dive to videotape a band's performance. As mentioned on the opening page the Cheepskates took advantage of the club's camera and hired two more, as well as securing a separate audio recording of the show. Unfortunately, the more popular the club became the more the performers demanded from the owner in the way of sound, lighting, and free drinks etc. And yet his only source of revenue was at the bar. Now this was complicated by the fact that in 1982 the legal drinking age in New York was eighteen. In 1983 the legal age was raised to nineteen. And in 1985 it was finally raised to twenty-one. All of this contributed to a very young "scene" for the psychedelic shows. A lot of those in attendance were just not used to paying bar prices, especially for beer. And the owners biggest complaint was that people were leaving the club, going down the street to the nearest deli, and returning with a can (or cans) of beer under their coat. That, or they just weren't drinking at all due to any amount of hallucinogens they may have ingested. Fed up with the hassle of trying to please all of the performers all of the time the owner finally sold the club in the spring of 1985. And though through renovations it would cater more to the ever growing music scene, a lot of the charm (as well as chairs and candle lit tables) that came with the original cabaret setting was forever lost.